A quick scan of my micro-sized office will reveal the remnants of a business English conference: brochures and catalogs on the floor, my ticket stubs tucked beneath the scanner, business cards propped up by a six-day old coffee cup -but drat, where's the American guy's card, what was his name again? Oh and of course, my ultra handy netbook is resting precariously on top of my filing tray - the mini computer looks like a cute toy even though it's actually more powerful than my laptop - he's (his full name is The Little Blue Guy and we're in love) just FULL of draft versions on the different sessions I attended at BESIG. Ya, my work's cut out for me! BESIG 2008- video by Karenne Sylvester is licensed under a Creative Commons Attribution-Share Alike 3.0 Unported License. You have my full permission to download a copy or embed it into your own blog/website. To do so, go here. To learn more about creative commons, come here. The BESIG organizers organized a very, very efficient event. As soon as one entered the door, it was clear what to do, where to go and how. Coffee abounded, there was lots of space and most of the presenters were highly professional, prepared and interesting with much knowledge to pass on. Timing - 40 minute sessions are too short. Most of the presenters could not stay within the time frame, understandably. My personal recommendation would be to provide one hour sessions instead, asking trainers to present for 45 and leave 15mins room for questions and discussion. While the great majority of the sessions I attended were fantastic and I'll report on those, some weren't. Some were an utter waste of time. The main problem seemed to lie in the fact that the trainer didn't know who he/she was presenting to. Sometimes I felt like I was in someone's very tiny personal institute rather than at an important BE conference - sort of like being with a bunch of unqualified trainers who were being taught the first round of basics or being given information best saved for an in-company group meeting. *obviously it's not always necessary to use new media, when it's not used the presentation should still be commanding. This needs to be a double session (or at least 1.5hrs). There was only time for 2, max 3 questions(?). The room was jam-packed: we had stuff to hear and stuff to discuss, we are your community: your purchasers, your reviewers, your critics - there wasn't enough time to do this in. John Allison, aside from your fantastic materials, you're a clear and dynamic presenter and I am actually going to cave in and buy yet another Business English coursebook, if you're involved in The Business, I'll check it out. Emery, I may never ever fly again but I will pass on your details if I meet teachers who want to specialize in aviation English. Schofield, my students are currently reading/listening to your readers, enjoying them so far and I've asked them to write up the reviews themselves! We'll post the results up soon. Prof. Azennoud I really enjoyed learning about Morocco - it snows in Morocco!! !- and your developments there, thanks for coming to Germany to share. Where does the buick stop? The news are currently a-buzz with corporations lining up to hold out their begging bowls in the hope that something, anything will rescue them from the worsening financial crisis. One of the most ridiculous of these is quite probably the BIG THREE, the CEOs of the giant US automakers (Chrysler, Ford and GM) who somehow did not have the vision to implement a change to smaller, high mileage, 'greener' vehicles and who now need a bailing out to the tune of $25bn. I say 'vision' somewhat sarcastically. The last few years have seen an outpouring of commercials advertising their so-called greenness which suggests that they did indeed recognize the trends in the market yet hesitated about doing anything about it other than launch propaganda machines. Instead they dined like kings, sipped Cristal champagne, earned upwards of 40k A DAY and now, surprise, surprise, they must go to PapaUSA (i.e. the American taxpayers) for a little cash injection. How long will it be before other global car-makers, except Toyota LOL, rock on up with the same plan? It's not their fault? Pah! But their errors, if left unsolved, will cost the world's employees in jobs, be the end(!?) of a stable global economy - opinions range and are as hot as they are indifferent - yet can you imagine what will happen when hundreds of thousands worldwide (millions if you count semi-related industries, especially in the US) lose their jobs? Can you imagine the knock-on effects? The US government and our governments will probably have no choice but to rescue the car-mega-corporations and their factory workers. How very, very careless you have been Mr Mullaly, Mr Nardelli and Mr Wagoner (yes, even if you just recently took on your jobs). Shame on you. Do you really expect the man on main street to pour yet more capital into your extravagant business models with narry a word on how you will effectively restructure and clean up your shops? Lordy B, I can't help but muse on whether or not big OIL will need bailing out next! Just stirring up the pot to show you how highly controversial and topical this subject matter is and how you can use it to make an exciting ESP lesson: be it with your financial students or those in the automotive industries. Note: Most of these vids are made up of various car ads and a report on the 'SEXYgreenCARshow'. You can not make this stuff up - if you teach ESP:automotive students you'll have a whale of a time with this video, the language is generally slow and clear. The "Ripple Effect" video at the end is well, seriously scary - a nice finish to a lesson on this theme (it's fast though so have a finger ready for the pause button). In 3 of my classes today, the craziest thing occurred while showing the GM never-seen-before ad - the men (one banking class, one insurance, one automotive) all talked back in English, involuntarily, to the projected screen and text/images. Some just named the models as they whizzed by - all mentioned Opel, others 'hmphed' and made fun of the philosophy underlying the video. Most interesting -definitely a keeper. To download the entire playlist or to simply choose which you'd like to use in your class(es), go here. divide up and set the various articles as homework by sending on the links to your students (if you can't do this, get them to skim for gist in class). If by the time you read this blog entry, decisions have already been made you might want to look for new articles. A pre-search link to googlenews is set here - as a general rule (in my experience) bloomberg and reuters tend to have shorter and easier business articles, iht is a good link for students because it has translate-a-word functionality, BBC and Guardian Weekly often have topical worksheets for language learners prepared; financial press and blogs tend to be harder - full of lower frequency words. As much as possible try to vary the "slant" if you want your students to really discuss! review the vocabulary students had difficulties with, especially concentrating on chunks of text and idioms used in a business context. show one or two of the videos as a pre-task, intro and/or to review vocabulary (not sure how to download video? go here) If unable to do this, send your students the playlist and let them choose what they'd like to watch. discuss the articles for comprehension or simply get them to summarize their articles' slant or positions introduced - encourage students to agree, disagree and generally opine. ask how this issue is being reported in their own media - should the automakers get bailed out? Why, why not? Are car makers in their own countries turning up with hat in hand? Big class - split up your students and ask them to play the role of Nardelli, Wagoner, Mullaly; other students play the role of the government (Pelosi, Obama, Bush, governmental economic advisers etc) and yet others play the role of the union bosses. The rest of your learners can play the man on the street: factory workers and normal joes (themselves). Ask your students to design the focus of the roleplay themselves, getting them to spend some time thinking of what they will say - then hold the debate. Small class - with 3 students or less, ask students to play the role of the President's economic advisers who will be interviewing the CEOs. Their task is to prepare hard-hitting questions (regarding future plans, how the bailout money would be spent and on what). Advanced levels - with your higher students control (!) their language, encourage them to flex their grammatical muscles: to use the future continuous, perfects, passives and perhaps even use some 3rd conditional in natural context! ;-). Another video, from Sabine- thanks, worked like a charm- but man, rough stuff! If you've got a top tip related to this theme, don't hesitate to share - simply click on the green line that says Comments and add your opinions, lesson ideas or any relevant links to websites, blogs on the same topic - I don't mind! The other day I was training a group of teachers on developing their learners' speaking skills and one of the participants asked me where I got my pictures from and whether this was all on the "up and up." It suddenly dawned on me that actually a lot of EFL and ESL teachers, materials authors, newsletter, journal, blog and freebie ELT magazine writers don't actually know about creative commons. 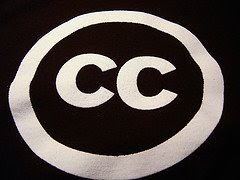 Creative Commons is a type of license that is added to a piece of work (photo, music, video and more) and rather than assign copyright to it the author gives permission for this item to be used by whomever, as long as they appropriately attribute it (put the name of the author). 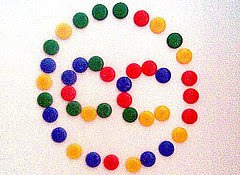 You can also do an advanced search from google, yahoo or directly in flickr, blip.tv, spinXpress. How can you use it in class? I use it to create interesting worksheets, make the cover pages for my commercial worksheets, make games to divide up my training groups, use photos in my blog entries to make them look interesting ;-) LOL, have even used a piece of music as backdrop to my video, etc. The bottom line is that you can have as much fun and be as creative as you like. For free! Of course, it's always a nice idea to give back too and these days I walk about with a camera and have been uploading my own stuff into flickr and of course, my blog entries are CC'd too and institutions or teaching associations are welcome to use them in their magazines. Can you do anything at all with the stuff you take? Well, actually there are six different types of creative commons licenses so I generally do an advanced search and specify how I'm going to use something and then go from there. I also try to make sure that I respect the originality of the work and its creator by letting him/her know when and how I've used something. They always like this ;-). A longer, more in-depth, video and explanation behind the philosophy and concepts of creative commons can be found here. Attribution Non-commercial No Derivatives (by-nc-nd) This license is the most restrictive of the six main licenses, allowing redistribution. This license is often called the “free advertising” license because it allows others to download your works and share them with others as long as they mention you and link back to you, but they can’t change them in any way or use them commercially. Attribution Non-commercial Share Alike (by-nc-sa) This license lets others remix, tweak, and build upon your work non-commercially, as long as they credit you and license their new creations under the identical terms. Others can download and redistribute your work just like the by-nc-nd license, but they can also translate, make remixes, and produce new stories based on your work. All new work based on yours will carry the same license, so any derivatives will also be non-commercial in nature. Attribution Non-commercial (by-nc) This license lets others remix, tweak, and build upon your work non-commercially, and although their new works must also acknowledge you and be non-commercial, they don’t have to license their derivative works on the same terms. Attribution No Derivatives (by-nd) This license allows for redistribution, commercial and non-commercial, as long as it is passed along unchanged and in whole, with credit to you. Attribution Share Alike (by-sa) This license lets others remix, tweak, and build upon your work even for commercial reasons, as long as they credit you and license their new creations under the identical terms. This license is often compared to open source software licenses. All new works based on yours will carry the same license, so any derivatives will also allow commercial use. Attribution (by) This license lets others distribute, remix, tweak, and build upon your work, even commercially, as long as they credit you for the original creation. This is the most accommodating of licenses offered, in terms of what others can do with your works licensed under Attribution. As I strolled into the Haus der Wirtschaft I was immediately struck by two things: the gorgeous setting amidst statues and art pieces and the sheer quantity of English language teachers milling around. Lindsay Clandfield: materials writer, author of the Macmillan Straightforward series, web contributor for OneStopEnglish, columnist for the Guardian Weekly, highly commended for the Duke of Edinburgh award was in the Haus, and man, us teachers were looking forward to a great training session. Oh and I've a confession to make! Around three years ago when Macmillan asked me if I wouldn't mind being observed teaching by Lindsay and his editor, I had zero idea of who he was and said yes with barely a blink. Nowadays, knowing all he's done in his life, for teachers and the world of ELT, I'd be way too intimidated to do that again. Ha! Ignorance is bliss, eh? It was a gorgeous German Friday afternoon in November. Lindsay, on tour with Hueber and Macmillan, was here in Stuttgart doing a workshop on how to make great grammar explanations. 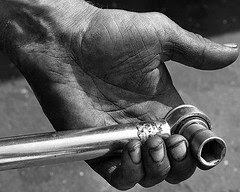 Time to polish up those old rags and tune up the tools, guys! Well that depends on you: your teaching style, your philosophy, your students' learning styles and their needs. Sometimes, when it comes down to teaching grammar, inductive student-centered training is simply not economic. Sometimes one, or the other, leads to frustrations for the learner and obviously, the teacher. Change tact when and where necessary. Lindsay headed over to the flip-chart and sketched a line which he then broke up with slashes at the bottom, top and middle then called out "What's this?" With barely a pause we yelled out "adverbs of frequency." Did you do it too? We're such ELT geeks, aren't we! After that we pooled our different symbols, signs and the sketchings we often use with our students. Given the setting, it wasn't really that surprising to find out there were a number of artists present. We were engrossed as the story of his great-great-great grandfather's arrogance lost his ancestors an inheritance and how a man's pride can lead to an alternative legacy. If Papa Clanfield hadn't tossed a ball of rags into a lake, we might never have had the opportunity to see great-great-grandson Clandfield in action - he'd be sitting in a posh manor instead. It was highly entertaining, we had a good giggle at his expense but it was also serious grammar teaching - the story he used reviews gradeable and non-gradeable adjectives. What are your stories and how do you use them in your classrooms? After that, Lindsay moved on over to the whiteboard, took out a black marker and began sketching again. He called out "What's this?" We looked, a man, a face? "A man" we cried tentatively. "He has a broken...." Lindsay drew the cast. "leg." Then he drew another circle. Lindsay laughed and filled in her hair and eyelashes. "What's her name, what's their relationship?" "The window's closed but the man is hot, what does he say?" "Could you open the window please?" "The man is thirsty, what does he say?" "Would you mind pouring me a glass of water?" Of course one thing to note is that when explaining grammar, it can take up vital communicative, speaking-in-the-classroom time, so think carefully about how often you want to use these methods and focus on the ones that encourage the most response. We haven't really talked about the economic part yet. Straight translation is, as Lindsay said and I agree, the most economic method of all. I confess to not doing much of this myself - English only classroom rules and all of that - however I do allow it as part of a post-task activity (my word for homework). Basically my thoughts are, if the students have a very low level of English it takes up an extraordinary amount of in-the-class learning time to explain something and with some aspects of grammar perhaps a quick overview in their own language might be more effective. If a structure is totally new, it should be presented most thoroughly in the maximum of methods and styles to ensure saturation of knowledge. The entire toolbox should be used. Being amusing, being personal, making it relevant. With higher level groups my philosophy is that it is also important to go backwards, tune the machine, fix those rusty screws and set students back on track, wrenching them away from bad habits - the more entertaining the more likely it is that it'll stick - your explanation will serve as a bridge to what was actually taught. Of course when there's one student in a group, with one particular area of stubborn weakness, the most economic path in my opinion, is sending him a quick link to Grammar 330 with the instructions of practice-practice-practice. sssh - mustn't tell you too much, yet! Many, many thanks go to Hueber for bringing such a dynamic professional over to train us here in Stuttgart, for free: you rock! I hate the words "Blended Learning"
I woke up this morning thinking about tags. Aside from the fact that tags are things which hang off the collar of your shirt, tags - in the world of the web - are used by people who create content (text on web-pages, blogs, media etc) and they are used to bring these like items together. The tag system is at its finest form on delicious where they have even gone a step further and created bundles (a way of creating uber categories for your tags) but you can also find them on youtube, slideshare and just about any web 2.0 website. Examples of tags include the blue labels at the top of this and all my posting - they're there so that if you want to find another blog entry which is similar then all you have to do is click on one of those and travel around. Back to my point, the reason for writing this post:: I really, really, really, hate the term blended learning. It doesn't say anything to me - a blended what? A mix of... oh man, what does that mean exactly? Are we talking about mixing skills or are we talking about mixing styles... I mean if I use a tape-recorder instead of my smartphone to listen to an audio recording then I'm now not blending? Why is that device any different to any other device.... And how exactly do I tag that in my posts - using the keywords blended+learning? Nah, don't like it. I just can't do it anymore, I simply cannot get my fingers to type this phrase nor to make my mouth to move that way. In fact I can't even get my head around it. I even looked it up on wikipedia and then got a rather in-depth explanation that even they'd like to be cleaned up. The explanation brought me somewhat closer to its meaning, I guess, but sorry love the concept hate the brand, way too stuffy for my tastes. There's a little irony in there but ya kno', it says what it is. A good language institute will consistently make an effort to keep its teaching staff up to date on modern teaching practices and new methodologies and Tom Carlson, DOS of Linguarama Stuttgart, certainly excels at this. Although his training style can sometimes be teacher-centered, I can honestly say that over the last four years he's provided me with many new ideas and overall been a great influence. I've learned so much from him and look forward to much more! Anyway, this latest workshop was entitled Projects in the Classroom and in this blog posting, I'll review some aspects of Tom's transparencies, go through the quotes he presented for us to reflect on and at the end of the posting provide one of my own tried&tested project concepts. Great theme, isn't it, and so vital for long-running courses. Have you ever tried doing a project with one of your business English groups? It's such a smashing way to engage students and encourage collaborative learning.If you've done any project work in your adult EFL/ESL classes, don't hesitate to add your tips and tricks in the comments - even if they weren't BE oriented. We discovered, after careful searching, that there's really little out there, in print or on-line and yet there's a strong market for this type of work and age group. If you're a materials author or a wannabe.... this is a niche! Just quote me and Tom in your acknowledgements, ok!? to counteract some of the "same old, same old." collaboration leads to confidence, is highly motivational and provides continuity. projects give students ownership; students buy into working together not just as a learning activity. provides realism and is highly communicative. Planning ahead is the best weapon you have for avoiding these problems so you still need to be ready to think on your feet! Tom then handed out a few quotes from Project Work, Diana L. Fried-Both, OUP 2002, to all of us teachers - we had to think about what the quotes meant, what effects would be desirable in a language course and how our students would be affected. We also had to think about problems which could occur when planning or implementing projects. Project work draws together students of mixed ability and creates opportunities for individuals to contribute in ways which reflect their different talents, creativity, language goals and styles. As colleagues we agreed in general with the quote and thought about how projects encourage team cohesion, how it feels natural to the students (reflects their lives, simulates their professional work) and gives the students an opportunity to learn something about themselves. Of course, one area to watch out for is the possibility of having team members who are really very dominant! Your role is perhaps the most vital in trying to maintain an overview and inspiring confidence so that your students feel they are learning by working towards their objectives. As long as aims are formed and clarified by the group of students, we agreed with this statement. We felt that clear strategies should also fall within the process of planning and that the teacher's role should include regular feedback to ensure that they themselves can see that they're learning. To get a copy of a good, simple speaking skills feedback sheet - from my website, go here. The irony is, the more passive you appear to be, the more successful the project is in terms of learner autonomy and independent learning. However we all agreed, if you do less - the students do more. Student-led activities require teachers to step back. The line has to be carefully defined, the borders firmly in place because passiveness in the classroom can also be perceived as laziness on the teacher's part and some students, depending on their cultural backgrounds, will strongly object if they aren't actually being controlled! On the other hand as Jim mentioned, when doing projects there's actually more opportunity to feedback to the Training Officers/HR managers regarding the students' English levels and abilities to deal in a team within another language setting. It was a very good session - ta, Tom! Students have to create a company (or use their own/one in their field). They are required to define a product or service, establish the objectives and mission of this work - it does not need to be something serious, they work out the financial viability of their concept, create a presentation for venture capitalists, present the presentation and win funding (or not). Best with a large group so that you can make at least two competing groups but not essential (have also done this activity with a class of 4). Best results occur when you can find another BE EFL class within the company or institute who will be prepared to act as the venture capitalists. Working with another teacher is lots of fun and their class can research millionaires and take on their personalities (see Forbes 500 for list of global millionaires). Failing this, in the final lesson you can also act as if you are one. Supportive photocopiable sheets from Business Communications Games, Business Builder, Business English frameworks to discuss: mission statements, company structure, corporate culture, company history, company image/designing a logo, sales figures, trends and graphs, employee morale. In the first lesson, present the idea to the students. Explain what materials you have which can support the activity. Get them to decide what they would like to do, how they will create both company and product and what supportive materials they think would be a good idea to use in order to learn the necessary lexical steps (I usually give them the books and let them choose but you can bring in photocopies of relevant sheets and let them do a scan of them and decide). Get them to do a full project plan and curriculum timetable, ask them if they would like to establish roles and decide who's doing what. In my experience, each time that I have done this project with BE adults, I have been wowed by the results and out-of-class effort the students have put in. One group created a new bicycle and then found pictures of future bicycle concepts and photo-shopped them to carry "their" own logo. 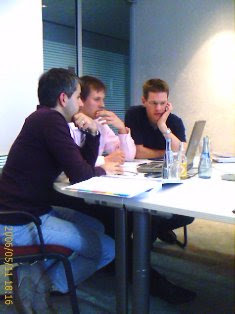 Perhaps I'm just lucky, but even at one company I worked at, our sister class who had become the millionaires took the project very seriously indeed, reviewing the presentations with the utmost of sincerity, eventually granting "5million" to one of the teams! Go on ahead and share too - click on COMMENTS - a box will open up and you can write out your project there. Or, if it's something you typed up you can e-mail it to me and I'll stick it somewhere with a link to it. If it's already on your blog or website, simply write the link for us all below.